I’m offering a holiday-favorite Bready or Not recipe again to help kick off Rhonda Parrish’s Giftmas Blog Tour. Rhonda lives up in Edmonton, Alberta, and she’s hoping to raise funds for the Edmonton Food Bank. I’m all about helping to feed people! Please donate if you can. Note that funds are listed in Canadian dollars. Rhonda is also doing a giveaway as part of the tour. She’s making a crocheted throw. The winner gets to choose the color, and she is shipping it anywhere in the world! 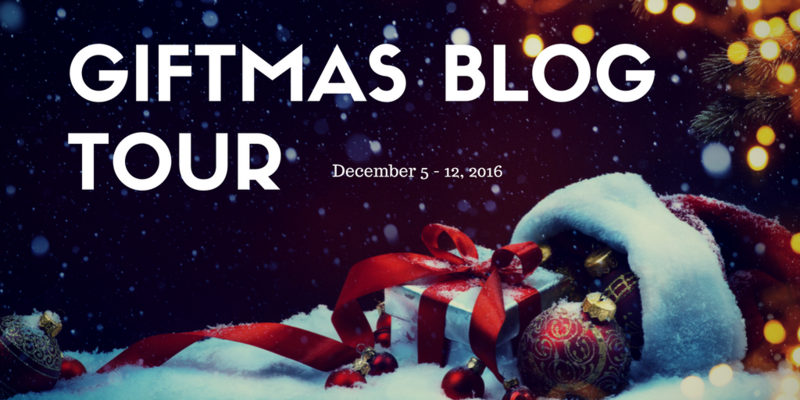 Wander around to other stops on the tour over the next week. 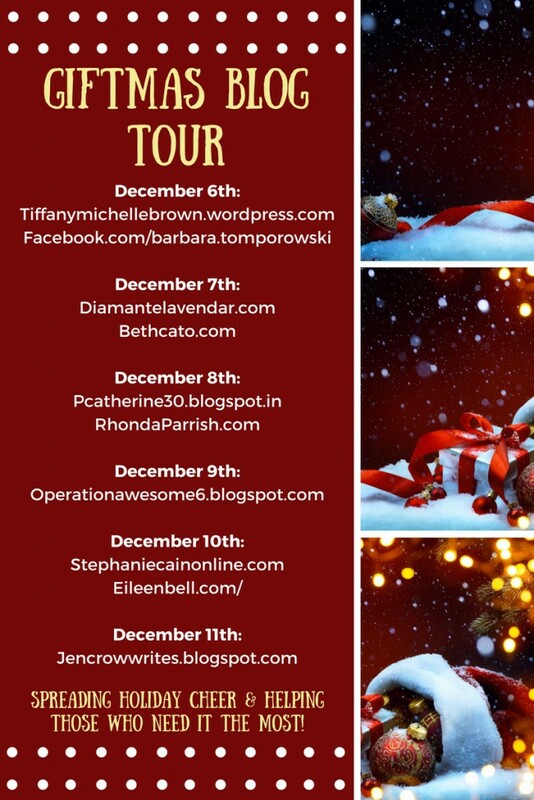 I’ll post another favorite recipe at Eileen Bell’s site on the 10th! 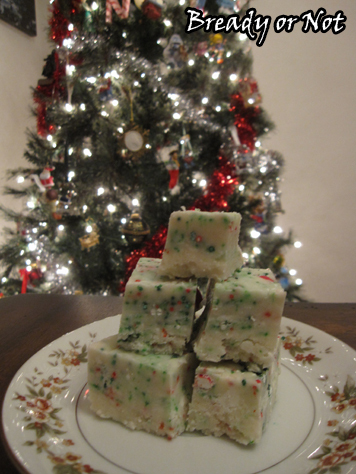 This is a sweet cause, so here’s a recipe to make something especially sweet: microwave fudge that uses cake mix! Eating this fudge is like licking the paddle after mixing up cake mix batter. If you prefer savory over sweet, this recipe isn’t for you. This is for the people who love fudge and frosting and all things sweet. I didn’t limit myself to sprinkles in this. I had some Christmas candies, the type for topping cupcakes and such, that had been sealed away for a year. It had been a great post-holiday clearance buy. I wanted the containers GONE, so I pretty much dumped the contents into this fudge. That’s why you see little light bulb shaped candies in there. 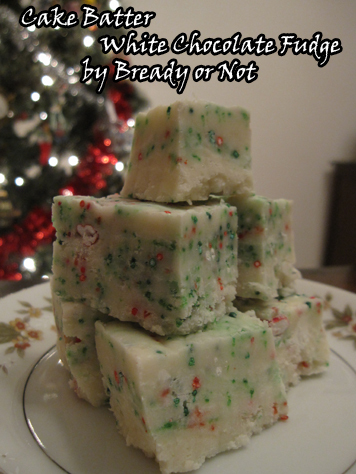 This is obviously a great Christmas recipe, but it’s an easy one to customize year round depending on the colors you mix in. Make fudge to support your favorite sport team, or pink and red for Valentine’s Day, or pastels for spring. Cake mix goes on sale all year round, too, making this a pretty cheap recipe to throw together. Whatever you add in, I’m sure it will be pretty. And delicious. So very, very delicious. Modified from Sally’s Baking Addiction. This microwave fudge comes together in minutes and creates sweet fudge with the help of some cake mix! This isn’t a recipe to be confined to December. 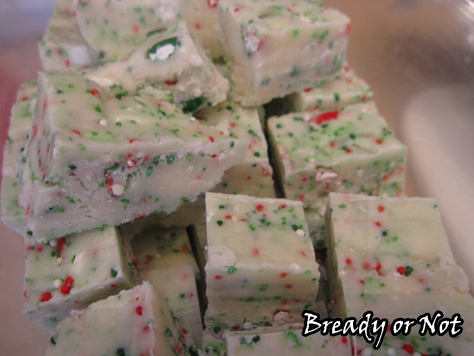 Add different sprinkles to make this fudge seasonally-appropriate (or sports team appropriate) all year long! Line an 8×8 baking pan with aluminum foil or parchment and spray with nonstick spray. Set aside. 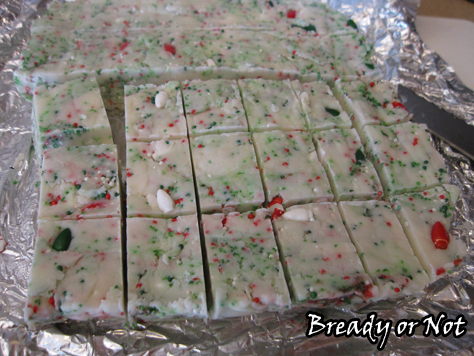 Measure the white chocolate chips and the sprinkles in separate dishes so they are ready to add quickly. Mix sifted cake mix and powdered sugar in a large bowl. Add milk and butter, without stirring, and microwave for 2 minutes. Promptly mix ingredients until the butter is fully melted and incorporated. The batter will be very thick. Fold in white chocolate. Add the sprinkles last and stir gently so they don't leak too much color. Scoop into prepared baking pan. Level it across the top. Chill the fudge in the refrigerator for at least 2 hours before cutting into small blocks. Fudge will keep upwards of a week in the fridge, if it lasts that long.